• 6 weeks, 5 days/week training specifically built to prepare military and other athletes for deployment to urban conflict areas. 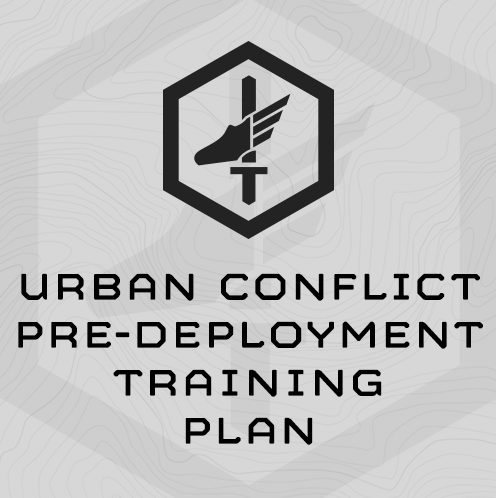 The Urban Conflict Pre-Deployment Training plan is a 6-week, 5 day/week training program mission-specifically designed to prepare military and other athletes for deployment to urban conflict areas such as Syria, Iraq and the urban parts of Afghanistan and Africa. Level changes and upper body pushing/pulling – wall jump and dismount, climing through windows, low crawl, etc. This training plan deploys mission-specific work capacity assessments and follow-on progressions, and thus automatically scales to the incoming fitness of each athlete. The 6th week of the plan is an unload/taper work, so this plan can be completed directly before deployment. Friday: Multi-mode Endurance/Stamina + Easy unloaded run. This is the first version of this training program, built May 2017. This is a limited equipment training plan – designed to be complete at any SOF or line unit with resourceful leadership. Sandbag (40# women, 60# men). The plan is built so 1x sandbag is needed for every 2 athletes training. My unit doesn’t have sandbags. What should I do? Make one and take it to the gym when you train … a sandbag (40# for women, 60# for men) is required for this program. We sell sandbags at mtntactical.com, other venders sell them, and you can make your own using an old duffle bag. Be resourceful. See our Exercise Library HERE. The Run Calulator is listed as an exercise. Start prone on the ground. On “Go” pop to your feet and sprint the prescribed distance. Slow Walk Back to the Start after every sprint. The walk back is your rest between efforts. (2) 3 Mile Run at a “Easy” pace.